Used and Second Hand Northumbrian Small Pipes. 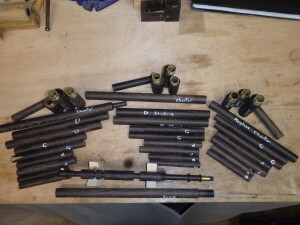 I’ve just completed the commission of a 7 key set in Blackwood and Brass, with imitation ivory end caps for delivery to Italy. 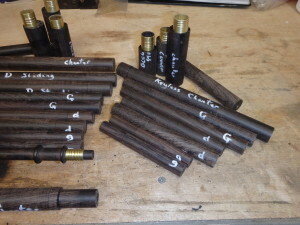 I was recently commissioned to make a keyless set of Northumbrian Pipes. 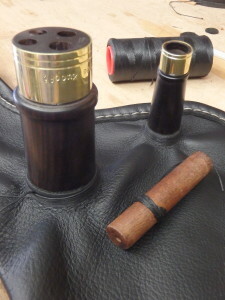 These are a rarely made, but early version of Northumbrian Smallpipe. After initial turning of the blanks, I started work on the drones. 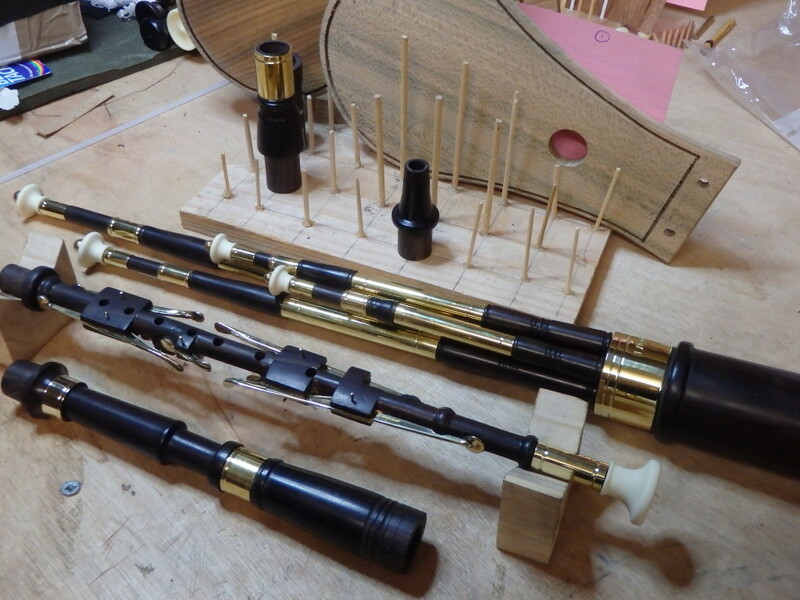 Drones are completed and the Chanter turned. 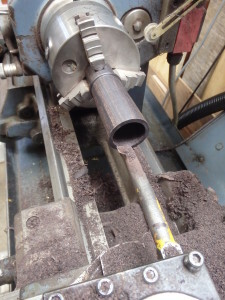 Tone holes are drilled in the Chanter. When starting a set, I quite like to building the drones from the stocks upwards. This means I need to make the stock first, then rough out the standing sections and finally the sliding parts of each drone. 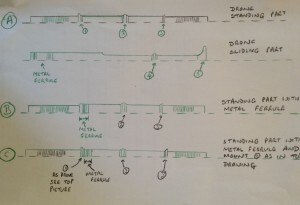 Following this plan, I’ve made up the drone stock for the keyless smallpipes set. 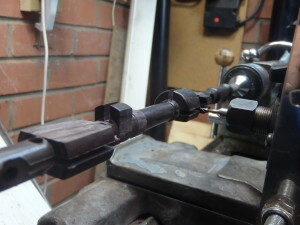 Starting with a rounded length of blackwood and a section of brass tube. The Blackwood is roughly shaped and drilled to take the drones. 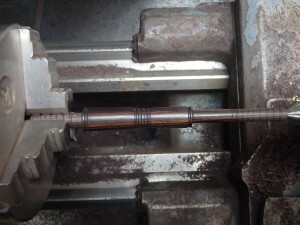 The stock is reversed in the lathe and the taper shaped. Now the body of the stock is hollowed out. The brass ferrule is fitted and it’s ready for final polishing. Now this is complete I can start turning the drones and build the set up form this base. I received a nice parcel containing Tagua Nuts recently. 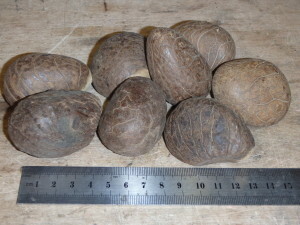 These are from the Palm Nut family, and are also known as Vegetable Ivory. They’ve been used over the years for making buttons and for decorative carvings. Each nut is about the size of a Satsuma. Under the skin, the nut has a hard, waxy texture and is a lovely creamy, ivory colour. 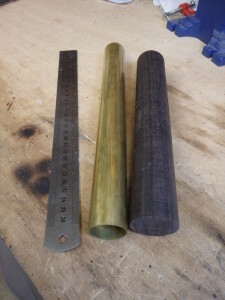 Always on the look out for new materials to experiment with, and as makers of other types of bagpipes have been using these for mounts, I was keen to give them a go. 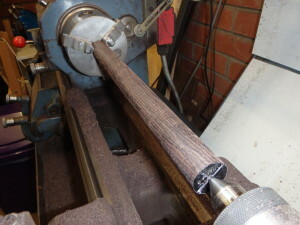 On the lathe, they turned beautifully and easily and I was excited by the way they worked. But then I found their problem. Each nut has a hollow area in the centre, which only became apparent when the work was almost completed. 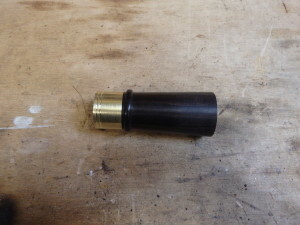 Because drone and chanter end caps are relatively large, I couldn’t turn them without encroaching on this ‘space’ in the nut. Sadly, it doesn’t look like these will be viable. 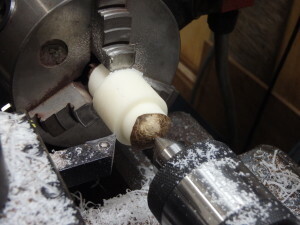 It would be possible to cut the nuts open before using them, and select a piece which would be suitable to smaller mounts or ferrules, but it’s a shame they wont be suitable for end caps as it’s a lovely material. A busy day in the Northumbrian Pipe Makers Workshop. Today has been a day of preparation, with several projects underway. 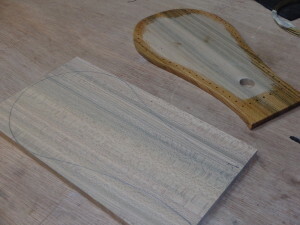 I’ve been turning down the wood for three sets and you can see them here. 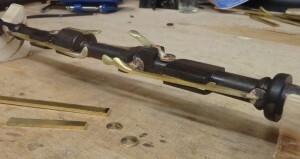 Each set has a Chanter, and two turned pieces for each of the four drones. 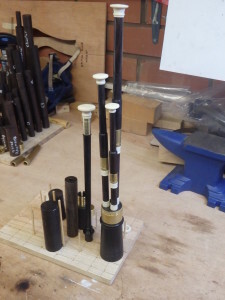 You can also see the smaller pieces above each set which will be the stocks needed to connect the chanter and bellows to the leather bag. These will each have a metal ferrule which not only looks great but adds strength where the sections join. 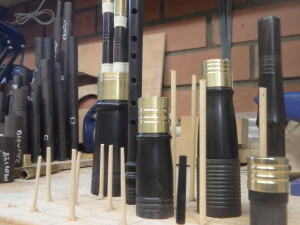 At the bottom of the picture are a couple of extended chanters I’m working on. These will each have 17 keys when finished. Of the three sets shown, two are 7 key sets but I also started today on the Keyless set. 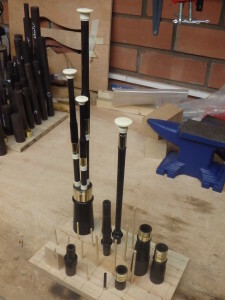 You can see the shorter Chanter and wood for the three drones required for this set. Now that these have been roughly turned to size, they’ll be rested for a while and given further time to settle. 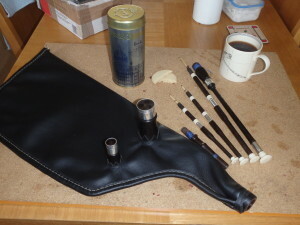 This step is important, and gives me time to make the bags, the bellows and dedicate some of my time to making the keys for the extended chanters. For more information on buying a set of Northumbrian Small Pipes contact me at Kim@Northumbrianpipes.co.uk. 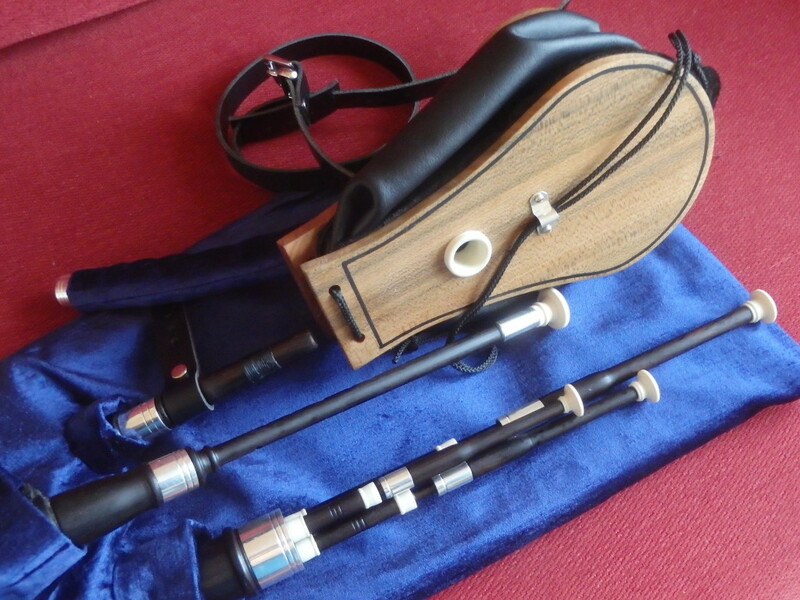 I’m delighted to have been commissioned to make a Keyless set of Northumbrian Pipes. Most sets now have 7 Keys and 4 Drones. This set will be different. 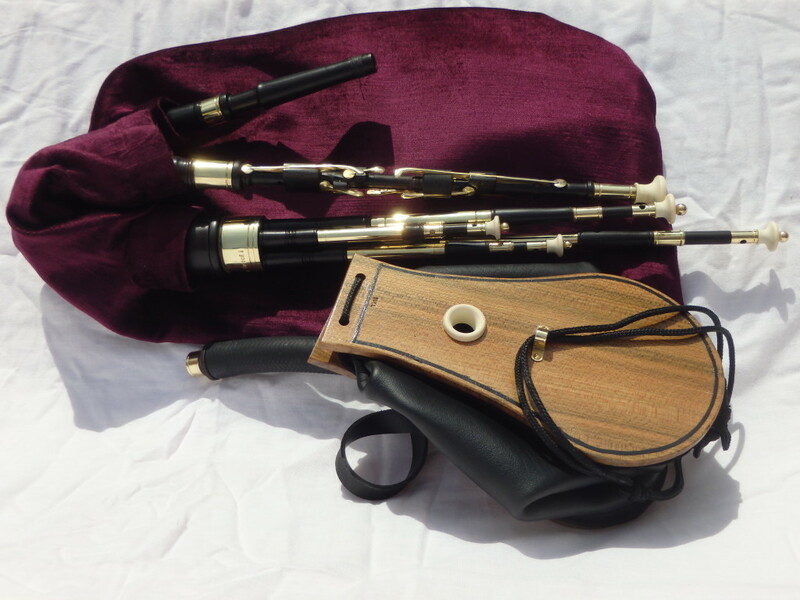 The ‘original’ Northumbrian Small Pipes were beautifully crafted with a keyless Chanter which played 8 notes. Pitched in Pipers’ G (F+20 cents), the 3 drones were tuned to Gdg with no need to change key. Being keyless, the chanters are slim and elegant, and the three drones complement the simplicity to form a delicate and beautiful set of pipes. 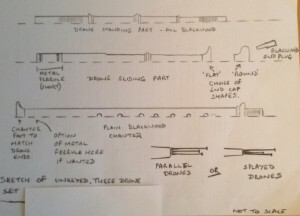 My first job is to sketch out some design options. To accentuate the simplicity of the instrument we’ve decided on slim, clean lines which emphasis the wood, with simple end caps and mounts to provide a subtle contrast. 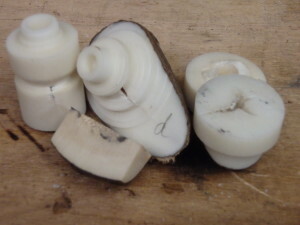 End caps and mounts are often made from Blackwood or imitation ivory, but we’re going to use Tagua Nut for this set. Also known as Vegetable Ivory, it was extensively used for small carvings and making buttons but modern materials have largely taken over now. In keeping with a ‘basic’ and simple design, metalwork will be subtle to allow the beauty of the wood to be most prominent. 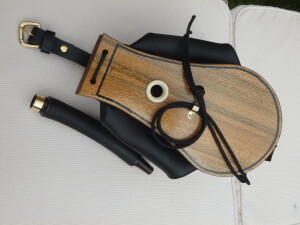 Northumbrian Small and often Border Pipes are bellows driven, so each set has a set of bellows. For this set I’m using Elm for the cheeks. 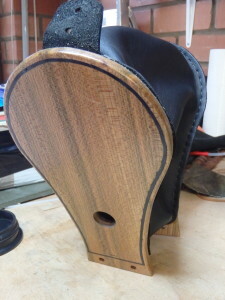 The Elm is cut to shape and a stitching groove established near its edge. This groove is then drilled and what will be the inside of the cheek varnished while it is accessible. 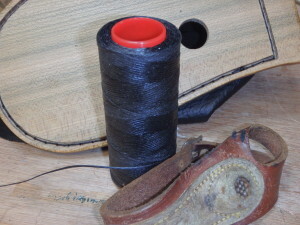 The Leather is hand stitched through the drilled holes using Saddlers Stitch. This stitching takes time and is done in such a way that an airtight seal is established between the leather and the wooden cheek. 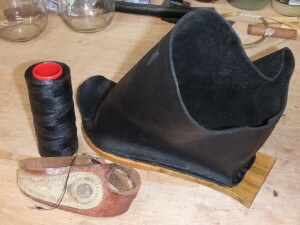 Once completed, the one way air valve will be made and the leather belts, hinge and straps fitted. The Bellows are then finished off and tested. 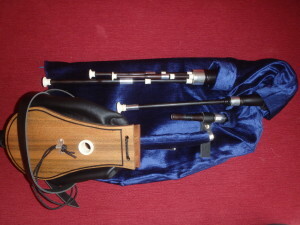 Northumbrian pipes are available either with or without keys. 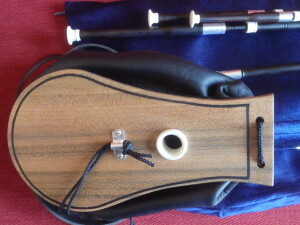 Originally, the instrument had a plain chanter with no keys and a unique and distinctive repertoire to tunes were played. 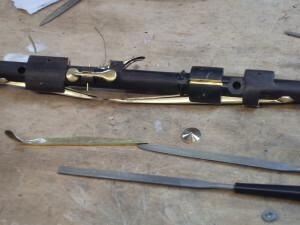 In the 18th Century, this chanter was developed by makers in Newcastle-on-Tyne and North Shields through the addition of keys. This allowed pipers to explore the fiddle repertoire as well as the older pipe tunes of the region. Keys are hand made, which is an extremely time consuming job. However, the results are well worth the effort, both in terms of the tunes which can be played and the beauty of finished chanter. 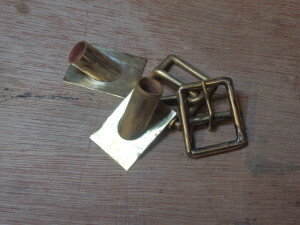 I’ve been making keys this week from brass sheet. This is cut, cold forged and filed to shape. 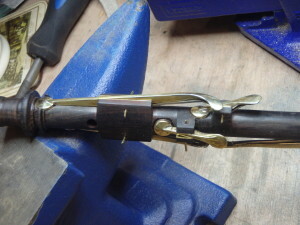 The round head which will cover the hole on the chanter is cut and soldered on before a leaf spring is hand made and riveted to the key shank. 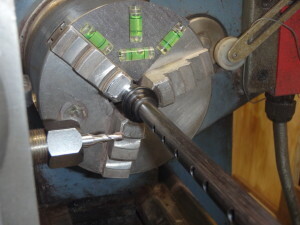 Once finished, the key is drilled to take the pin which attaches it to the chanter and final shaping and adjustments are made to ensure a smooth action. 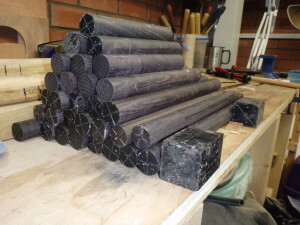 The most popular wood for Northumbrian pipe making is African Blackwood. 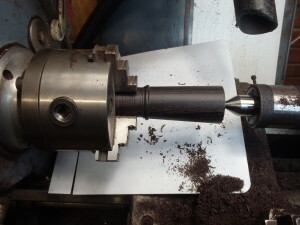 This is bought in squared billets and my first job is to turn it to rounds on the lathe. Once turned, each piece is individually bored to the appropriate diameter, cut to length and then returned to the shelf for several months. This allows the piece to slowly dry and prevents cracking. 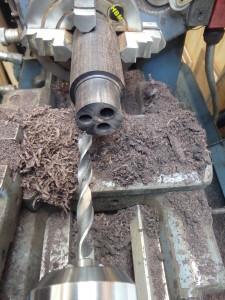 I’m starting this blog as a record of what I do, and when you order a set of pipes you can see some of the work which goes into them and follow their progress. 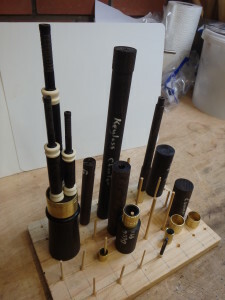 © 2019 Northumbrian Pipes Hand Crafted by Kim Bull. All Rights Reserved.